WIU graduate student Ryan Bronaugh is pictured at the White House with a copy of "Veterans Voices" that is now in the building's library. MACOMB, IL – While paying tribute to the military accomplishments of a close friend and fellow soldier, graduate student Ryan Bronaugh represented Western Illinois University during a Congressional Medal of Honor Ceremony at the White House. 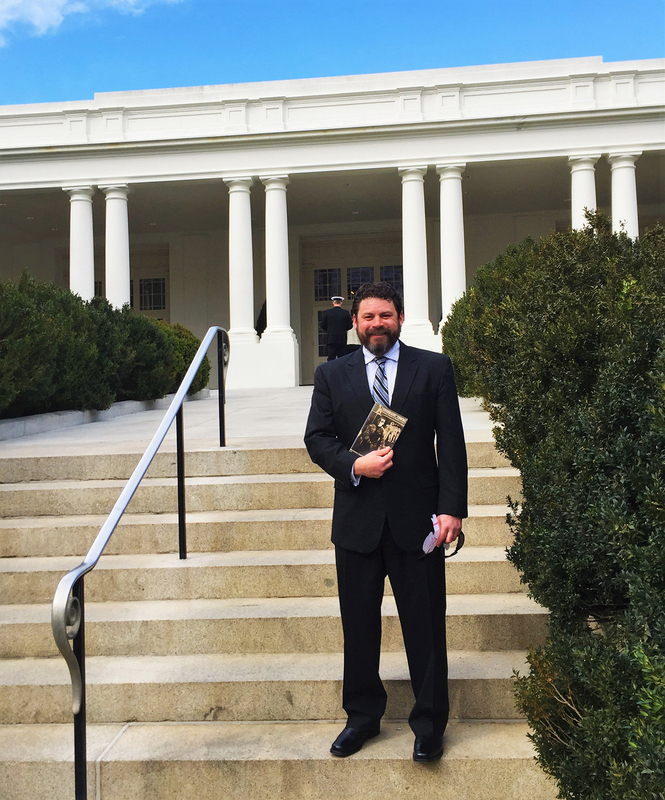 The visit to the nation's capital also gave Bronaugh an opportunity to hand deliver a copy of Western's inaugural "Veteran's Voices" publication to the White House. On Feb. 29, Bronaugh traveled to Washington, D.C. to support his friend, Navy Senior Chief Special Warfare Operator (SEAL) Ed Byers, as he received the Medal of Honor from President Barack Obama. Byers, a member of SEAL Team 6, received the medal for a December 2012 mission to free an American doctor being held hostage in Afghanistan by the Taliban. Bronaugh and Byers have been close friends for nearly 17 years, since being stationed together at Camp Lejune (NC) as battlefield medics in the Marine infantry. "We would, over the years, complete several schools together and make our way into more specialized communities," said Bronaugh. "We did a number of deployments together, and as the years passed and we were no longer serving in the same units or going through the same schools at the same time, we did manage to stay in touch." Bronaugh chose Byers to serve as a godfather to his children and he was a groomsman in Byers' wedding. About two years ago, Bronaugh learned Byers was being considered for the Congressional Medal of Honor. "Obviously, I was elated, mainly because he would be alive to receive it, which is far from the norm," said Bronaugh. "Over the last couple of years we have managed to see one another a few times a year and usually speak on the phone as often as work and life permits - generally a few times a month. We text almost daily. He is truly my brother in every sense of the word." When Byers received the news about his medal from President Obama, he asked Bronaugh to come to Washington, D.C. to experience the occasion with him. "He also requested I fly in early so I could be there and help with some of the last minute planning and day-to-day logistics, and to partake in some of the very cool benefits that came with the ceremony. I was given a full tour of both the Congressional and Senate floors, as well as halls and rooms in the Capitol very few civilians get to see," he said. As Bronaugh traveled to the White House with Byers, he was able to carry a copy of the first edition of "Veterans Voices: Personal Stories of Combat and Peace," a collaborative project between the WIU Veterans Resource Center and the WIU Department of English. The copy was signed by Barbara Harroun and Jacque Wilson-Jordan, both assistant professors in the WIU Department of English, as well as Kathy Meyers, assistant director of the Veterans Resource Center. Bronaugh gave the signed copy to a friend and former Marine, who now works with the U.S. Secret Service. He later learned that the copy has been placed in the White House Library. Bronaugh and fellow student veteran Jared Worley are serving as editors of the second edition of "Veterans Voices," which changed its name to "SITREP: Veteran Perspectives on Combat and Peace," is currently being compiled. The balance of the White House trip was spent honoring Nicholas Checque, who was killed during the mission that Byers received his medal for. "The next day Ed was inducted into the Pentagon's Hall of Heroes, where, I feel, he delivered his best and most polished speech," said Bronaugh. "I can assure you and the country (world), there is not a more deserving person of this honor. I am not only proud of him, but of this country for honoring him in such a way." For more information about the second edition of to "SITREP: Veteran Perspectives on Combat and Peace," visit bit.ly/1RJOHYR.